Hard Candies... with maple flavor! A great candy gift, year round! Hard maple candies have become more and more popular recently and we're pleased to now offer them packaged in a decorative gift box tide with a colorful ribbon. There's enough candy here to last a long time. A wonderful gift at the holidays or year round. If you live in a hot region of the country, hard maple candies are also better to ship and less likely to be effected by the heat. 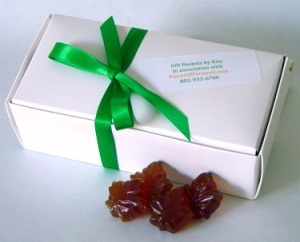 35 pieces of delicious, individually packaged, maple-flavored hard candies per gift box. Ingredients - maple syrup, glucose, sucrose. In otherwords - granulated sugar and corn syrup.